Our two new members shown here with President Vicki and their sponsor Helen were inducted into Nambour 76 last week. Peter Mansfield is a former Rotarian and Past President from Mossman and other clubs in North Queensland. He is a retired veterinary surgeon, now involved in the Men's Shed at Woombye. Julie Mansfield is new to Rotary, also retired and comes to us from a career in banking management. 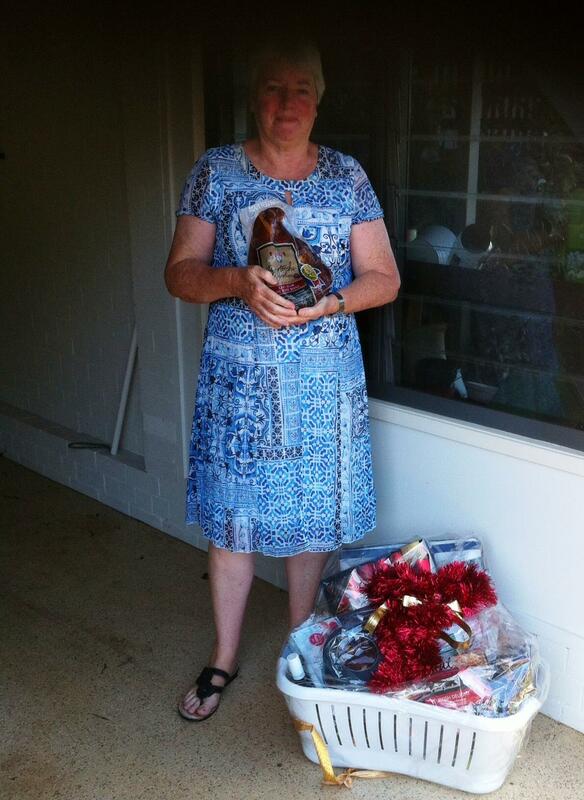 She is a volunteer at the Woombye community library where she came to the attention of eagle eyed Helen, always on the lookout for potential new Rotarians. Jenny Horton gave us a very inspiring talk on polio eradication. In 1978 two people, one a Nambour accountant, started things moving. Now there are just 41 cases in the world, 32 in Pakistan and 9 in Afghanistan. Nigeria was delisted two days ago. Rotary has given 1.33 billion dollars towards this cause. Because of the Polio infrastructure this was able to be used to eradicate the recent Ebola crisis, which took three and a half months. They are going to use their knowledge and learned skills so that the knowledge is not wasted once Polio is fully eradicated. Welcome to the return of the bulletin. Vicki has agreed to take on the role of bulletin editor but she is away on family duties this week so I’m filling in. Two weeks ago we had our official visit from District Governor John Leddy and his wife Barbara. John spoke to us about the state of Rotary in District 9600 and emphasised the ongoing problem of increasing membership and about the meaning of Rotary and how to describe Rotary to others in just a few meaningful words. Barbara told us about her favoured project, Hummingbird House – a palliative care and respite centre for children. Alex advised that our club cluster is looking into a music event early next year to raise funds for this worthwhile project. Last week our guest speaker was Elizabeth Henley, a Rotarian from Cooroy but she was speaking to us as a board member of Sundale Ltd. Many of us are familiar with the Sundale story. The concept of an aged care facility in Nambour was first raised by the Apex club of Nambour in the 1960’s. 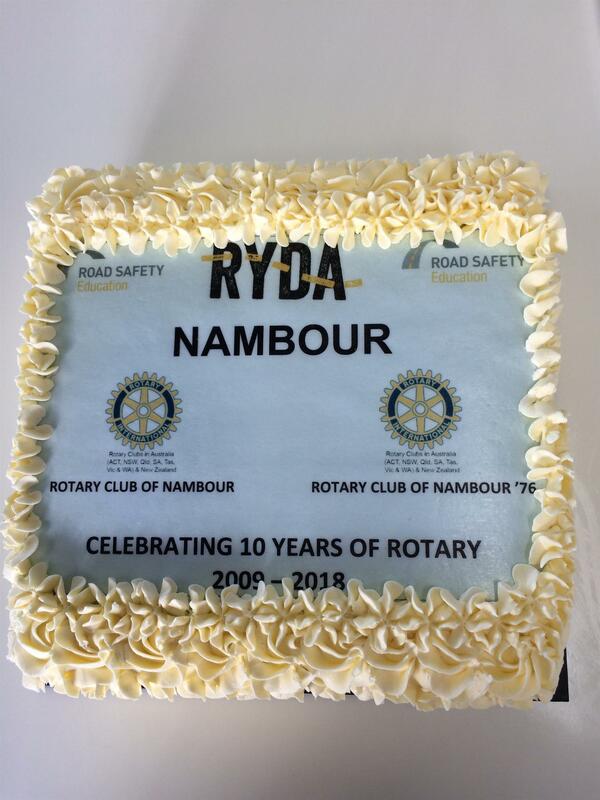 Eventually both the Rotary Clubs in Nambour came on board and the project grew to what it is today, a multi site, not for profit organization covering all aspects of aged care, as well as affordable housing and even child care. The original site in Doolan Rd, Nambour is set for a major renovation in the next few years. As a means of giving back to the community, the Sundale Foundation will be operating from next year. The history link in our club website, http://nambour76rotary.org/ contains some detail of our early involvement in Sundale. I have made a few changes recently to the website and our club facebook page. Have a look and let me know what you think. Fortieth Anniversary, Golf Club, 70s Theme. 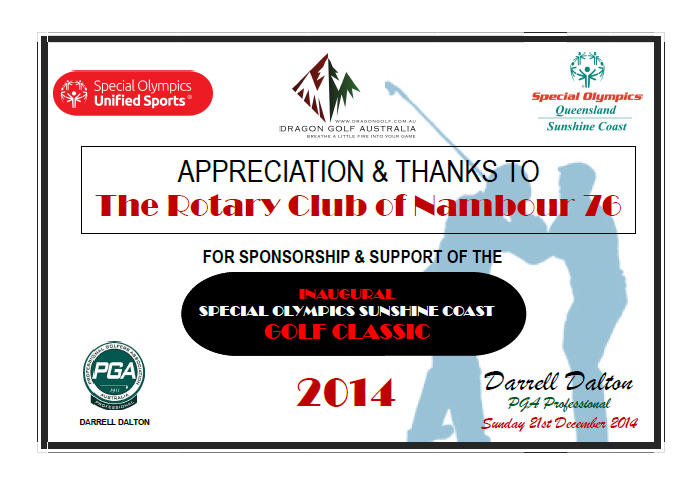 An appreciation certificate soon to be presented to the Rotary Club Nambour 76 for its sponsorship and support of the Special Olympics Sunshine Coast golf event on the 21 December 2014. This link is an article published in the Sunshine Coast Gazette this week promoting our upcoming Golf Day. Thanks to Gerald for organising the publicity. Also recently we were all welcomed to the home of Ron & Jill Garrett for a Sunday BBQ and farm tour. As the photo (click "Read More") shows, the "tour" transport was rather rustic. Many thanks to Ron and Jill for a great day. Welcome to my report. It’s been a little while. Social night at Royal George last week. Great to catch up. Best wishes and get well soon to Peter and Bob. Hope to see you soon. This week’s meeting we have RANZE students attending. Samantha & Erin. Our next major fund raising event, Sunshine Coast Marathon, Sunday 31st August 2014. We will need as many people as we can attend. More people we have the more funds we can raise. There will be 2 shifts, Start time 5:30am to 8:30am and 8:00am to 12:00pm or if you can commit 5:30 am straight through to 12:00pm. Can everyone think about whether you can attend as I will need numbers at this week’s meeting. I had a call from Doug Clark (Nambour) for numbers and names to place on the roster. The day will be here before we know it. Check out the events on our web site to keep up to date with what’s on. Membership Dues, Is everyone up to date? Some points of interest for Month of August 2014. Bruce, 16th August, 20 Years. Roster for meeting, 13th August 2014. At our May 7 meeting we recognized President Paul Frahm as a Paul Harris Fellow. 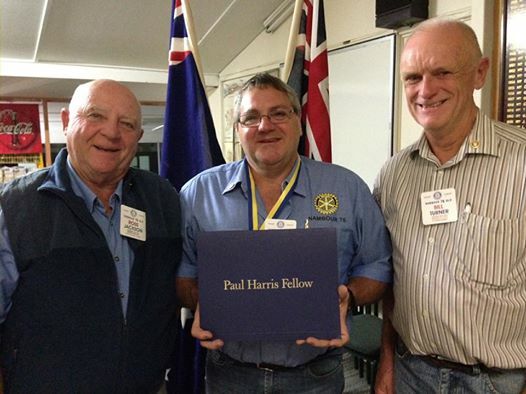 Paul is recognized after the club donated $US1000 to The Rotary Foundation. The award exemplifies Paul's dedication to community service and his breath of fresh air into our club and, not least of all, his agreeing to front up as President 2 years in succession. REMINDER, No meeting on Wednesday 21st May 2014. Meeting changed to RYLA Dinner on the 19th instead of Wednesday. REMINDER, No meeting on Wednesday 4th June 2014. Sydney Conference. A couple of very important Thank You’s. Bruce, acting Treasurer while Bill is away. Looking after the books. Veronika, acting Secretary while Helen is away. 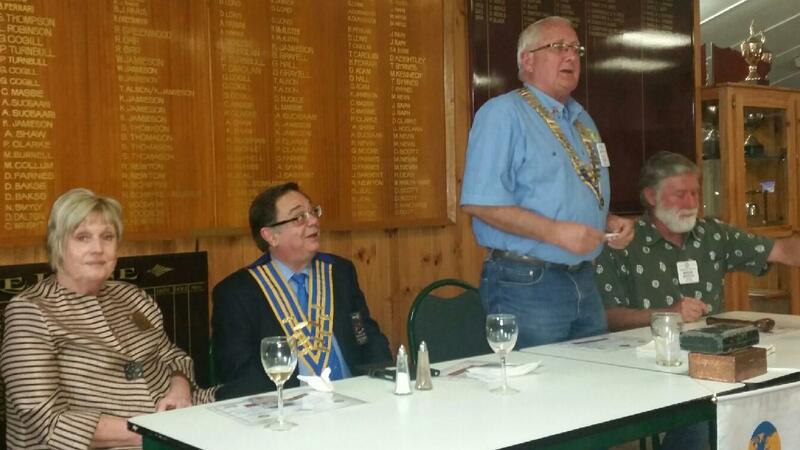 Last week’s meeting, guest speaker, Beth Pask spoke about the Teralba Assocation. The association has just acquired another house at Mapleton for men and needed help to furnish the house. Beth is a passionate fund raising coordinator for their group and also offered their men to help out with any projects we may have as way of thanks for support. RYDA, Monday and Tuesday this week. Thank You to a great team headed up by Ross for all your great work again. Thank You to Graham, Vicki and Graeme and Sashi for your help each day. Also the team from Moolooaba club. Thanks to Bill for the work leading up to RYDA. RYLA Dinner on Monday night. This event was a great night. DG Trevor and Robyn and DG Elect George Grant and Mary attended and presented certificates to all the RYLA participants and leaders. It was wonderful to see our youth shine. It was a busy day for Sashi, Vicki and Graeme attending after their day at RYDA. Congratulations to the team who ran this program, well done. Reminder for the Open Garden Day, Sunday 25th May 2014 and making the sandwiches on Saturday 24th. Check in with Vicki for information. Congratulations Graham for your anniversary on the 18th May (Sunday) 38 Years of service. What a milestone 38 years of serving your community. Well Done. 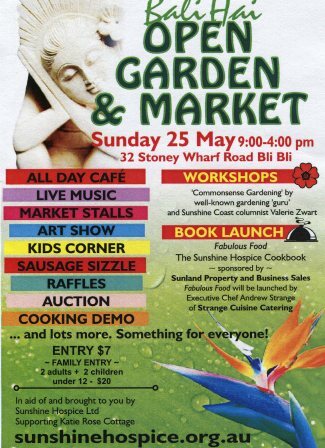 Open Garden Day, 25th May 2014. E-mail from Helen with all information on web site. Membership Dues, Is everyone up to date? Bill has you in his sights. Some points of interest for Month of May 2014. Roster for meeting, 28th May 2014. Last week’s meeting, what a night it turned out to be, full of surprises. Partner’s night, fun night and roll change night. To you all for coming along and making it such a good night. To Helen for coming up with the idea and baking your famous fruit cake for the raffles. To Kathy and Marline for running the meeting and making it so entertaining. Kath created another great trivia and word puzzle and great sergeant session Marl’s. To David for attending the attendance desk, great job. I knew you were a great choice to do this job. 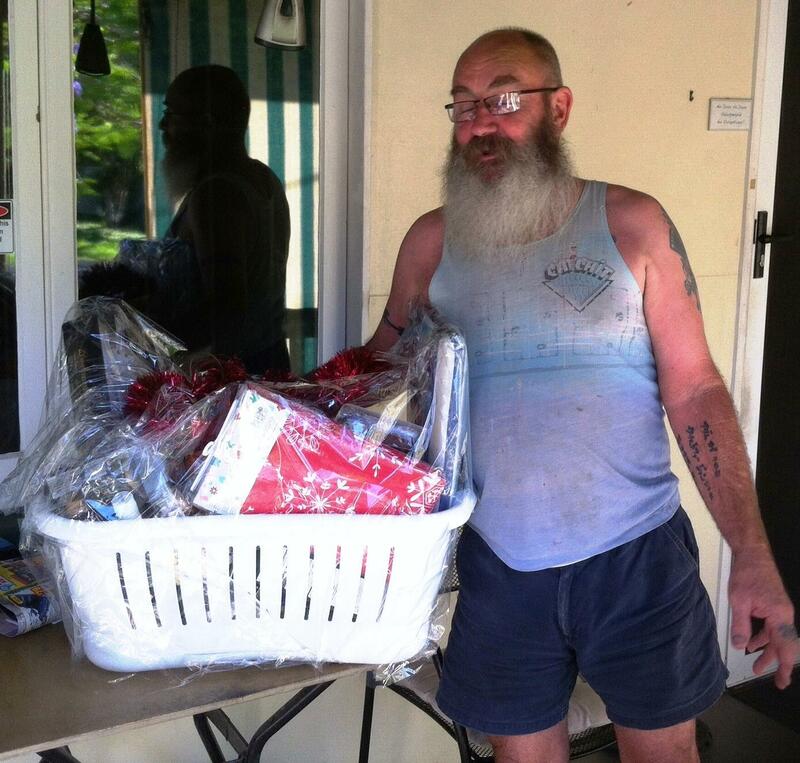 To Graeme for running the raffles, Great job. To Beryl for your beautiful flower arrangement. It was spectacular. To Alex for your carpet piece for raffles. To Vicki and Gerald for fruit baskets for raffles. To Leslie for the chocolate parcels for raffles. All in All another great job by team Rotary Nambour 76. Great to see Ron and Jill come along. We had a wonderful guest speaker Leslie with Part 2 of your life in Japan. What a great insight into life in another country and how you lived there. Thank you again for sharing your story with us. Can’t wait to hear the next chapter. I was very surprised, overwhelmed and honored to be named a Paul Harris Fellow. I just couldn’t believe it. It was extra special to have Ross and Bill do the presentation, they're like the god fathers of Rotary in our club. I would like to take this opportunity to thank Kath for all her support, couldn’t do this job without her. Thank you to our board members and you all for making our club such a friendly club. It’s like a big family. It’s a team effort and a great team we make. This week’s meeting we have a guest speaker, Beth Pask. RYLA Dinner, 19th May 2014. We have 8 attending. Can you please pay the $30 at this week’s meeting please. I have the following list, Alex, Bernie and Margie, David, Paul, Vicki and Graeme and Hisashi. Will make life easier on the night. RYDA at Nambour Showgrounds, Bill needs some helpers. Nambour High School students attending. Monday and Tuesday 19 & 20th May 2014. RYLA (Rotary Youth Leadership Award) Dinner, Monday 19th May 2014. Time 6.00pm Pre Dinner, 6.30pm Dinner. Cost $30 per person. RSVP 9th May 2014. Roster for this week’s meeting. Crossroads bbq event was on last Saturday. This was the 30th Anniversary of this event and sadly was the last. A big Thank You to our team of cooks and helpers Bill and Helen, Ron and Jill, Vicki, Graham and Dave who was taking guests for joy rides in his vintage car. Great work team Rotary Nambour 76. This Week's Meeting, 7th May 2014. Very Important Night. Partners Night, Fun Night. Roll Change Night???????? Please join in the fun and bring along your better halves. We will run a Raffle (Helen's famous fruit cake) and maybe a fine session depends on how the Sergeant is feeling? Board Meeting; Tuesday, 6th May 2014. Ron under pressure, 2 supervisors? Wow, End of another month. Mai was our guest speaker and gave us an enthusiastic report on her time at NYSF. How excited she was speaking about the lectures and programs she attended and people she met at the forum. She certainly has come out of her shell. Gordon asked a question and he received an answer was exceptional. We all wish Mai all the best with her studies. Tuesday, 29th April 1770. Capt Cook was in Botany Bay. Crossroads BBQ, (That's this weekend) Saturday 3rd May 2014. Yandina Primary School. Lunch scheduled for 12:15pm. We need to bring our club BBQ. Details are also on web site. We need to set up about 11.00am. Some points of interest for Month of April 2014. Next Week's Meeting, 7th May 2014. Very Important Night. We will run a Raffle (Helen's famous fruit cake) and maybe a fine session, depends on how the Sergeant is feeling? Well that’s Easter done and dusted, hope everyone had a good Easter weekend. It certainly went very quickly. Last week’s guest speaker Carol Van der Gaag who spoke about Medicare Local and registering online to their data base with your own medical information and create your own electronic health record. Mixed reaction amongst our members. Everyone will have to make up their own mind up to register or not. Thank you Carol for your time to come and inform us of this system. Not many of us knew of its existence. Bruce gave us an update on our RANZSE student Samantha Fraser. Sam is now over in New Zealand having the time of her life. Thanks Bruce for keeping us informed. Mai will be our guest speaker on 23rd April 2014 to give an update on NYSF. Mai will not be joining us for dinner but will arrive at 7pm to speak. ANZAC Day 25th April 1915 (99th Anniversary). I personally like to attend the dawn service every year. I feel it’s a very emotional time of remembrance of the fallen. Crossroads BBQ, Saturday 3rd May 2014. Yandina Primary School. Lunch scheduled for 12:15pm. We need to bring our club BBQ. Details are also on web site. On behalf of Kathy and me, we would like to wish everyone a very Happy Easter. However you like to celebrate Easter, enjoy and be safe. Social night at Royal George Hotel, Partner’s night. Great night catching up with everyone and our better halves so to speak in a social atmosphere. Nice to see Ron and Jill, Bob and Wendy come along. It’s like our Rotary family coming together. Thanks to Alex for taking all our meal orders and ordering, collecting money. Great job Alex. Mai will be our guest speaker on 23rd April 2014 to give an update on NYSF. Crossroads BBQ, Saturday 3rd May 2014. Yandina Primary School. Lunch schueled for 12:15pm. We need to bring our club BBQ. Details are also on web site. Social night at Royal George Hotel, Nambour. Partner’s night. Normal time. Unfortantually Mai could not attend this week. Vicki’s job talk. Thank you for your job talk last week. Everyone enjoyed hearing about the work you do. It was interesting to hear how you receive work files over the net and then return the finished letters back to the doctors. You had numerous questions from the members. Good one. You should be very proud of the service you provide. Great work keeping another great service on shore in Australia. Thank you to Bruce for your presentation on RYLA (Rotary Youth Leadership Award’s). RYLA seminar is from Friday 16th May to Tuesday 20th May 2014. Great opportunity for a young person 18 to 26yrs to attend. Venue this year is Luther Heights, Coolum. Applications close 11th April 2014. Club sponsorship cost is $595.00. Does anyone have an applicant in mind? We need to act now. D9600 Annual Conference, Friday 28th March to Sunday 30th March 2014. Venue: Maroochy RSL Conference Centre. Thank you to all the team for attending and flying Nambour 76 flag, mind you there were a lot of flags there. Our team of Graham, Paul, Ross and his grandaugther Monique, Sashi, Bill and Helen, Alex and Bruce were on hand at the Registration Desk. I was told we were very happy and entertaining desk people. Great job once again, I think we might be asked back!!!!!! Coming up, Open Garden Day, 25th May 2014. E-mail from Helen with all information on web site. Wonderful guest speaker at last week’s meeting, Kay Allars. Kay’s presentation was all about her career as a Beauty Therapist and the different aspects of this profession. Kay’s talk was very interesting when you consider the different types of applications of makeup and skin treatments provided and also trains students in this profession. We can see just how much Kay’s work can change someone’s life and build their confidence. Thanks Kay, your talk was great. Ross has contacted Peter this week and e-mailed me this update. Peter said to say G’Day to all and he is nowhere near dropping his bundle yet! Although many would have from what he has been through. Peter is on a second 16 day session of chemo “EVIQ”, with spinal injections. He then has 22 days of rest and observation. The specialist will do further scans and if the blood/nervous system is right they will reintroduce his harvested stem cells back into his system. Ross gave Peter an update of club news on happenings including winery trip and new members etc, etc. Thanks Ross, great work. D9600 Annual Conference, Friday 28th March to Sunday 30th March 2014. Venue: Maroochy RSL Conference Centre. Nambour 76 will be manning the Registration Desk. 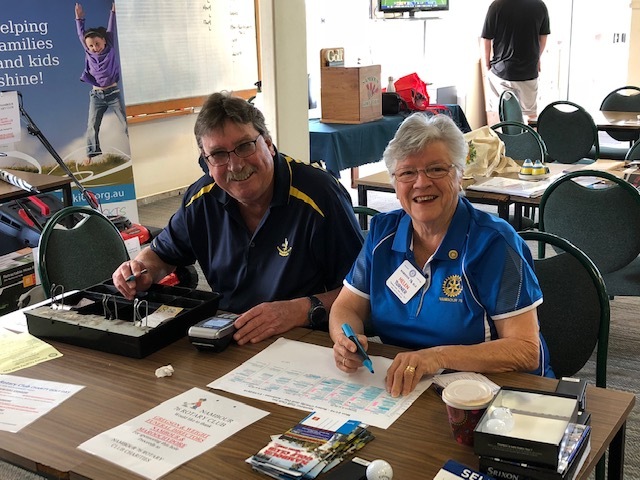 Remember to register on line, here is the link registration@rotary9600.org our club has 8 people registered, Paul and Kathy, Ross and Marline, Bruce, Hisashi, Bill and Helen. Please remember to register. Some points of interest for Month of March 2014. Peter and Marilyn, 4th March. ROMAC Trivia, We had 11 attend and a very successful night. The night raised approx. $12,500, great result. Our club donated $500 towards to ROMAC. A couple of happy snaps attached. Thanks to all who attended. Hope everyone enjoyed the speech by Cliff Dochterman (Rotary International President 1992-1993) to president elect’s. The presentation If I Could Be President Again was back in 2001 but is still relevant today. Entertaining and inspirational. Wine Trail weekend, 14th, 15th March 2014. Clovely Cottage (winery and cellar door) Moffatdale. We had a wonderful weekend. The B&B accommodation was just great, very homely feel and our caravans parked under a tree alongside the B&B. Girl’s visited Murgon Friday afternoon the do the shops over while the men relaxed under the shady tree back at camp. Friday night dinner was at The Cooperage Restaurant at Dusty Hill Estate winery. Excellent venue, meals and great value. One of the many highlights of the weekend was breakfast time. The conversations and carry on in the kitchen was priceless, you just had to be there. How do you boil an egg? Saturday was busy day, morning tea at Bjelke-Petersen Dam, lunch and wine tasting at Moffatdale Ridge winery out on the deck looking over the Barambah Creek and the country side whilst being entertained by a gentleman playing a saxophone (very hard life). Bridgeman Downs Cellars was the next winery for more tasting. Well time had got away on us and was time to retread back to the Clovely to have happy hour (felt more like 3 hours) and repair for our BBQ dinner. 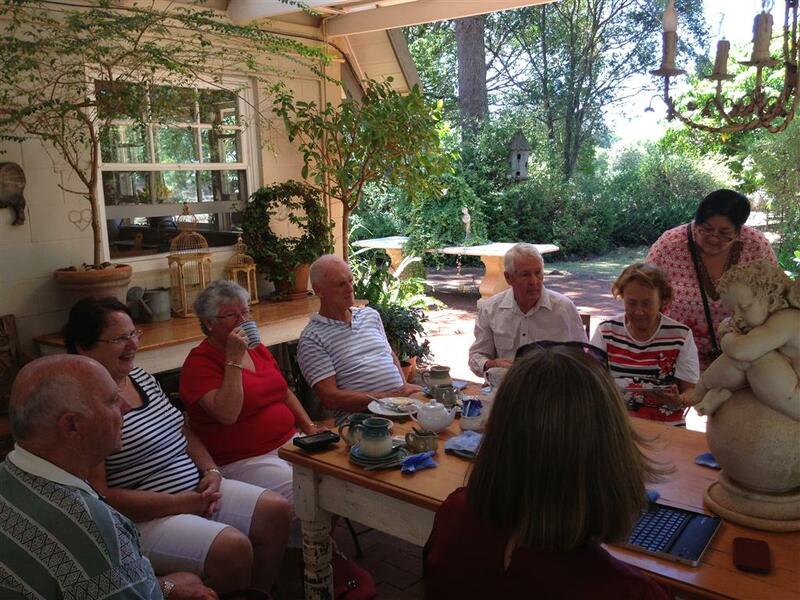 Sunday, we were off the Kingaroy to visit the Lavender farm and have morning tea and departing to home. Thank you all for a great weekend. We may have to do a return visit some time to do over the winery’s we missed. D9600 Annual Conference, Friday 28th March to Sunday 30th March 2014. Venue: Maroochy RSL Conference Centre. Nambour 76 will be manning the Registration Desk. Remember to register on line, here is the link registration@rotary9600.org our club has 8 people registered, Paul and Kathy, Ross and Marline, Bruce, Hisashi, Bill and Helen. REMEMBER NO MEETING TONIGHT, 5th March 2014. MEETING AT ROMAC, THURSDAY NIGHT, 6th March 2014. Can everyone attending ROMAC, can you pay me your $25 when you arrive so I can just make one payment at the door. The correct money would also help, Thanks. I have 11 attending in the Blue Book. Kay, Alex, Bernie, Paul, Ross, Vicki and Graeme, Sashi and Lesley, Bill and Helen. Murgon weekend, 14th, 15th March 2014. Clovely Cottage (winery and cellar door) Moffatdale. We are booked out for the B&B 10 people and 6 in their caravans.They provide provisions for your breakfast in the cost. There is a large dining table to use and BBQ is available to have dinner on Saturday night. I am still negotiating the cost, at this stage approx $125.00 per couple per night but will inform you soon. If you are still interested in coming along for the weekend please let me know. There is some accommodation available a short trip down the road at another camping park with cabins. I would like to thank everyone for attending our meetings each week and congratulate you for our club’s attendance record. In the last District Governors Newsletter our attendance rate is 82%. We are up there with the best of them. Great work team. A point of interest, this week council is voting on the Tram Way Project at Thursday’s council meeting. It will be interesting to hear their decision. I will be attending President Elects Training Seminar 2014 (PETS) this weekend, 1st and 2nd March. This year the seminar will be held at Ramada Resort at Marcoola. Kath will also be accompanying me. Last week we had a wonderful guest speaker Lucille Watson and Lucille’s husband Windsor came along in support. Alex, Thank you for introducing our guests. Lucille and Windsor own and operate Thrill Hill Water Park along with their family for the past 28 years. It was interesting to hear of their travels and the story of Dorothy Brooke with her love for animals in particular horses and the work she did with war time horses left behind after the wars. The Brooke foundation are certainly doing a great job caring for these animals in countries like the middle east who rely on their animals to do so many tasks day to day. Some points of interest for Month of February 2014. Last week’s meeting we were visited by Bryan Mason OAM who gave a presentation on ROMAC. Bryan is truly inspirational, his presentation on the big screen pulled at everyone’s heart strings. The work the team at ROMAC makes such a huge difference to children’s lives with treatment to their injuries and conditions they are forced to live with and do not have access to the medical facilities in their countries. Fantastic job team and congratulations for your results. Jan Lawton also visited to introduce our Australia/New Zealand Exchange Student for 2014, Samantha Fraser. Samantha gave a talk about her exchange trip to New Zealand and I’m sure you all join me in wishing her well for this wonderful experience. Have a great time Sam. 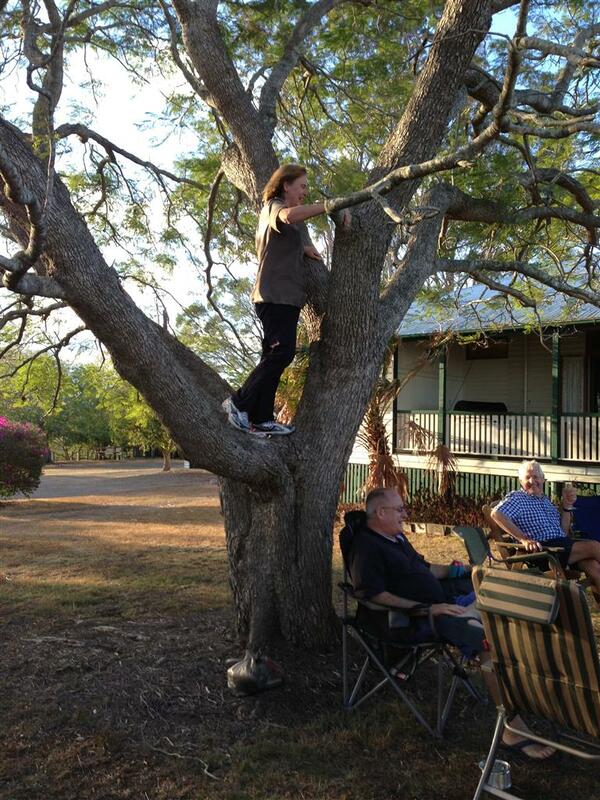 Murgon weekend, 14th, 15th March 2014. Clovely Cottage (winery and cellar door) Moffatdale. We are booked out for the B&B 10 people and 6 in their caravans. They provide provisions for your breakfast in the cost. There is a large dining table to use and BBQ is available to have dinner on Saturday night. I am still negotiating the cost, at this stage approx $125.00 per couple per night but will inform you soon. If you are still interested in joining us for the weekend please let me know. There is some accommodation available a short trip down the road at another holiday park with cabins. Still doable. 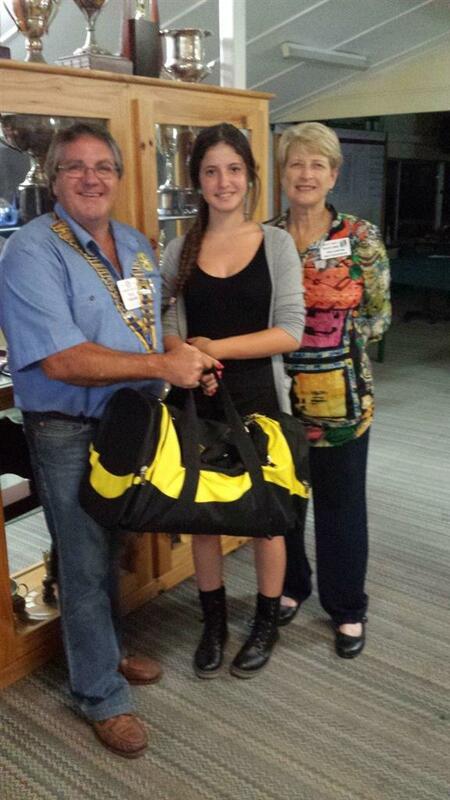 President Paul and Jan presenting Samantha with her Rotary Kit Bag. Last week’s meeting Wednesday 5th Feb was a vocational visit to Salvation Army new complex in Nambour. Combined meeting with Nambour and Woombye Palmwoods club and partners night. We had a great attendance with nearly all our club attending with our partners. Good to see everyone come along to what turned out to be a very interesting night. Big thank you to Bob and Lynne Smyth for organizing the night. Dinner was great and thank you to the team in the kitchen and our tour guides for the night. ROMAC, Bryan Mason OAM will visit our club Wednesday 12 February 2014 to do a 10 minute ROMAC Presentation video and discuss the triva challenge. He will require computer and projector. ROMAC Trivia challenge hosted by Caloundra Pacific club. Date: 6 March 2014 (Thursday) 6:30 for 7:00pm. Venue: Unity Colledge Auditorium, 47 Lomond Crescent, Bellvista Estate, Caloundra. Cost: $25 p/p including light supper. Jan Lawton will attend our meeting to introduce our Australia/New Zealand Student Exchange for 2014, Samantha Fraser. Our club is sponsoring Samantha. Murgon weekend, 14th, 15th March 2014. I would numbers for this event at Wednesday night’s meeting please. 12 people have booked already.Still watch this space. I have contacted Clovely Cottage (winery and cellar door) Moffatdale and they have a B&B available for this weekend. The B&B accommodates 10 people, 5 rooms x 2 and they will also allow us to park our caravans there for the weekend. They provide provisions for your breakfast in the cost. There is a large dining table to use and BBQ is available to have dinner on Saturday night. I am still negotiating the cost, at this stage approx $125.00 per couple per night but will inform you soon. Depending on numbers and who books in first there is also some accommodation at park up the road that have 3 cabins available and the motel in Murgon has some rooms available. Well took a while but welcome to my first report for the New Year. January just flew by. We have had some visitors come along to our meetings recently Rob Buroyne has been back for a few visits now and David and Caroline Jones (Alex introduced). It was sad news that David and Caroline will not be joining us at this stage but maybe they’ll visit again. Combined club project at MacKillop Village. Nambour Club have decided to pull out of the project with now a three way split for the funding. Melaine Ferguson advised the costs will be approx $1,000 to $1,200 each. We still have a surface water drain to finish off. Murgon weekend, 14th, 15th March 2014. Watch this space. I have contacted Clovely Cottage (winery and cellar door) Moffatdale and they have a B&B available for this weekend. The B&B accommodates 10 people, 5 rooms x 2 and they will also allow us to park our caravans there for the weekend. They provide breakfast in the cost. There is a large dining table to use and BBQ is available to have dinner on Saturday night. I am still negotiating the cost, at this stage approx $125.00 per couple per night but will inform you soon. Depending on numbers and who books in first there is also some accommodation at park up the road that have 3 cabins available and the motel in Murgon has some rooms available. No roster this week, vocational visit. During November we are very pleased to welcome two new members, Kay Allars and Vicki Paul. Welcome back my report, November was lost but December and Christmas is here. Congratulations to our two new members Kay and Vicki to Nambour 76. We’re on a roll? Ross gave us an update on Peter Crosby’s progress. Peter’s treatment sounds like its on track. Peter and Marilyn, we are all thinking of you, get well soon mate. Maybe we can have a beer for Christmas. Meeting on 20th November, Visit from Cooroy Club to present a cheques for money raised from the golf day to Katie Rose Hospice. Combined club project at MacKillop Village. 8 garden beds were built on Saturday morning 23rd November 2013. We had 13 energetic workers from Nambour 76 and Woombye Palmwoods come along and create the community gardens. The residents group was very thankful and pleased with their new garden. Morning tea was provided by the village. A couple of photos attached. This week’s meeting is all about the Rotary International Convention in Sydney 2014. Early bird registration deadline 15 December 2013, Cost $310.00US. Christmas Party Meeting, Wednesday 18th December 2013. Nambour Golf Club, Partners Night. Some points of interest for Month of November and December 2013. This week, REMEMBRACE DAY, 11th November 11.00am, LEST WE FORGET. World War 1 1918 Armistice Day. This is Part 1 this week, will have another report Part 2 later in the week. Congratulations to Kay Allars for your induction to our club last week. Great to have you with us and welcome. Welcome to Vicki Paul, looks like you could be our next inductee. WOW!!!! Presention by Rod Fishwick from ASV. 5.45pm for 6.15pm start. BBQ dinner at Dave's shop. Tonight is BYO drinks and fold up chairs. The working bee at Combined Project at Mary MacKillop Village, Carter Road will be on Saturday morning 23rd November 2013, not sure of starting time as yet, waiting for word back when bob cat will be on site. Check the blue book this weeks meeting. This week’s meeting is a social night, partners night and Sushi Chefs night. Visiting clubs Nambour and Woombye Palmwoods. I visited Marilyn Crosby on Saturday morning, had a chat and coffee and gave her the clubs card for Peter. Peter is undergoing a 16 week treatment of chemotherapy, chin up and get well soon mate. We all miss your smiling face at Nambour 76. Welcome to Kay Allars and Vicky Paul. Great to see you back each week. We must be doing something right. Combined club project at MacKillop Village. Talk about this issue Wednesday night. World Polio Day, Thank you to Bill and Helen and Graham for flying our flag on this day. I believe approx. $300.00 was raised, Great Job rattling those collection buckets. Sushi Chefs Night, club meeting night, Wednesday 30th October 2013. Partners night, come along to see some amazing sushi being created. Invited Nambour and Woombye/Palmwoods Clubs. Approx 59 coming along. We are running a raffle on the night so bring some extra change, no make that notes, you could be the lucky winner of a fantastic prize. See Bill at the door when you arrive. Check out the Club Events section on web site. Melbourne Cup Night, Tuesday 5th November. Meeting changed to Tuesday night instead of Wednesday. Partners’ night, dress up. Famous horse races held on the night so bring some extra change in your pockets to have a flutter. Vocational Visit planed for Wednesday night 13th November 2013. ASV Audiovisual, 21 Perwillowen Road, Nambour. Next door to David’s Trueline Smash Repairs. Our host Rod Fishwick will give us a display of his lighting and audio equipment. BBQ at Dave’s shed. Meeting on 20th November, Visit from Cooroy Club to help present a cheque for money raised from the golf day to Katie Rose Hospice. Some points of interest for Month of October 2013. Bob and Lex, 14 October 19?? Ross and Marlene, 23rd October 19?? Congratulations to Bob and Lex Sellars celebrating their 63rd Wedding anniversary on Tuesday 14th October 2013. Welcome to Kay Allars who has decided to join our club. We must be doing something right. Combined club project at MacKillop Village, we were hoping to work on project this weekend but may be supply problem with delivery of the beds. Talk about this issue Wednesday night. World Polio Day, Thursday 24th October 2013. End Polio Now. Combined 6 member team with Nambour Club to hand out information to public on Rotary’s amazing polio eradication program and fund raiser buckets collecting money, 2 hours over lunch time 12.00pm to 2.00pm. We are looking at manning two sites, Nambour Plaza and new Nambour Mill Village site. Can anyone help out? Charmaine Wheatly, Buderim Club, invited us to attend a fundraiser event, The Great Gatsby Gala Fundraiser, Sunday 20th October 2013, 5pm, Cost $35 per head, Buderim Tavern. Sounds like it will be a good event. Sushi Chefs Night, club meeting night, Wednesday 30th October 2013. Partners night, come along to see some amazing sushi being created. Invited Nambour and Woombye/Palmwoods Clubs. 50th Anniversary Book, Sundale. List of who have ordered the book, $20.00ea. Gordon, Hisashi, Alex, Gerald, Veronika, Marea, David, Bill Mackenie, Paul. Sorry there was no report last week, time got away on me. Congratulations to Bill Turner, Retired this week on Tuesday. Hey Bill, How was the sleep in Wednesday morning? From all at Nambour 76, Bill and Helen enjoy your retirement. Well that was short lived, guess who’s sergeant tonight? 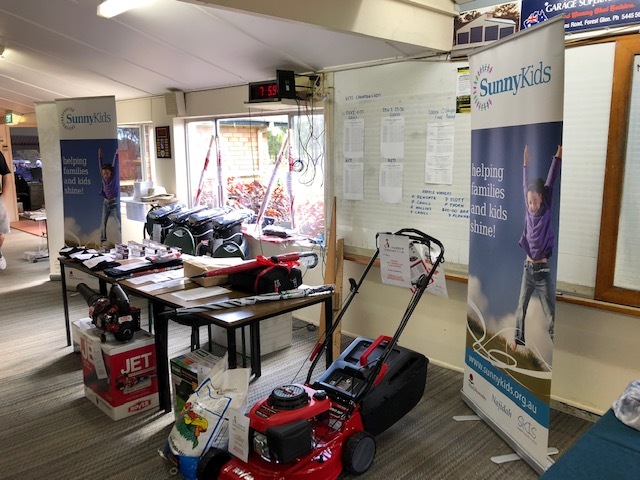 Golf Day was a great success; everyone had a great day out on the course. A huge THANK YOU to Helen, Gerald, Ross and Bob for putting in the hard yards on the day. Also all the other members who arranged sponsors for the day, Thank You. We are waiting for the final figures to come in for funds raised for Katie Rose Hospice. Great work team. The combined project at MacKillop Village has taken a new tack, looking into the corrugated steel colour bond style beds as an alternative the building timber sleeper beds. 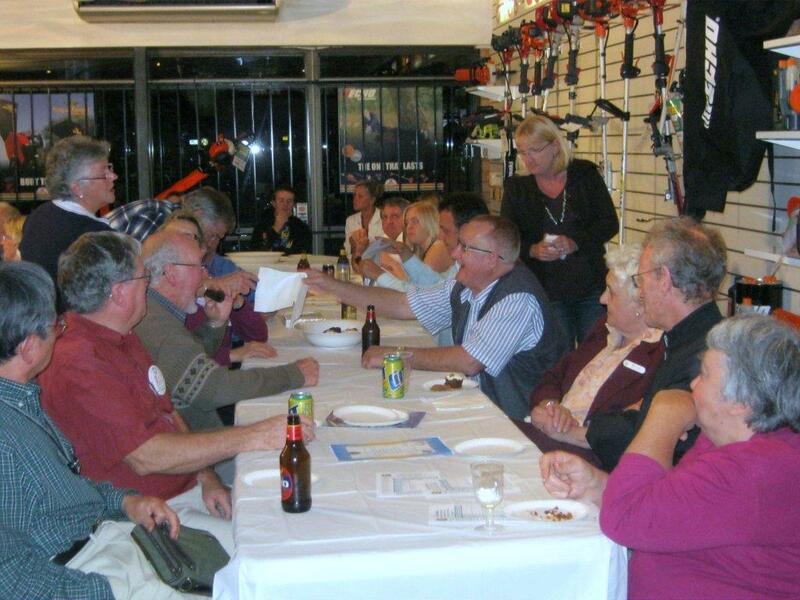 Social night with Woombye Palmwoods Club at Empire Organics, Mitchell Street, Nambour on Friday 18th October. Friday night’s they have a local jazz pianist, Laura Mitchell playing the piano. Cost is $34 per head; food is spectacular and exceptionally good value. The restaurant is BYO. We need to RSVP by 10th October. Interested in going? World Polio Day, October 24 (Thursday) End Polio Now. Combined 6 member team with Nambour Club to hand out information to public on Rotary’s amazing polio eradication program and fund raiser buckets collecting money, 2 hours over lunch time 12.00pm to 2.00pm. Maybe two sites, Nambour Plaza and new Nambour Mill Village site. Can anyone help out? Sushi Chefs Night, Club meeting night, Wednesday 30th October 2013. Partners night, come along to see some amazing sushi being created right in front of your eyes. We had our Biggenden Visit last weekend and what a great weekend. I firstly would like to thank Kathy for helping organize this event. Thank you to all who came along and made it such a great time. It was great to have Ron and Jill Garrett come along and share this weekend with us. Thank you to all who helped out over the weekend; it really was a relaxing time. A Big Thank You to Gordon and Kay for having us over to the farm and showing us around, you really made feel at home. We drove around the farm checking everything out. It was fun and interesting to see how as Gordon says he relaxes on his property, yeah right. There is so much to do. We had a BBQ on Sunday night and what a feast. Gordon generously supplied the meat (half a bullock) and had given me $50 to supply salads. Well there was a bit of a twist, Vi from the Biggenden Hospital Auxiliary was supplying the salads for us and she had decided to donate them. So not taking no for an answer we decided to pass the hat around the group and raised $180 and threw in Gordon’s $50 to give a grand total of $230 and donated it to the Auxiliary. Vi was over the moon and was so thankful. Now there’s a Win/Win. Kathy had also arranged a trivia for the night and was very entertaining. Great time had by all. Sundale 50th Anniversary Book, List of who have ordered the book, $20.00ea. Membership Dues, Is everyone up to date? $200 Year, $100 Half Year. Marea will be on hand with her trusty receipt book in hand. Election? And still counting the recount, who will take it out??????? It was interesting for you to at last meet Mai Yamanaka (NYSF), sounds like she will have a very busy time at the forum next year. I am meeting with Melanie Ferguson (Woombye Palmwoods Club) and Alan Sharp (Nambour Club) this Saturday, 28th September at 8.00am to discuss where to from here with the combined project (Garden Beds) at MacKillop Village, Carter Road, Nambour. I invite any of our members to join me to help voice our input into this project. Please let me know on Wednesday night if you intend to join me. I would like some support. Melaine has also extended an invitation to a social night at Empire Organics, Mitchell Street, Nambour on Friday 18th October. Each Friday night they have a local jazz pianist, Laura Mitchell playing the piano. Cost is $34 per head; food is spectacular and exceptionally good value. The restaurant is BYO. We need to RSVP by 10th October. Lionel, (Nambour Club) has contacted me regarding combined club presence in down town Nambour for World Polio Day, October 24 (Thursday) End Polio Now handouts. Combined 6 member team to hand out information to public on Rotary’s amazing polio eradication program. Anyone interested in joining this team? 2 hours over lunch time 12.00pm to 2.00pm. Maybe two sites, Nambour Plaza and new Nambour Mill Village site. Not sure as yet. Golf Day, Monday 30th September 0213. 8.30am Shot Gun Start. Biggenden Visit, Weekend 5th October – 7th October 2013. Has everyone booked their accommodation? Contact Motel to book your room. We have penciled in 4 rooms. Biggenden Motel, 44 Walsh Street, Biggenden. Our Membership dues are due, $200 Year, $100 Half Year. Marea will be on hand with her trusty receipt book in hand. Some points of interest for Month of September 2013. Well, vote outcome in Fairfax, but wait still counting, who will take it out??????? Any interest in fund raising idea, Organo Gold Products? Selling products as a fund raiser for the club, Yes/No. Mai Yamanaka (NYSF) is attending our meeting as guest speaker this week. Well, what a week. Where did it go? Voting, how cool was that? What a surprise in Fairfax, just ask Ross. Maybe Ross would like to have 2 minutes this week!!!!!!! Our meeting last week gave us an idea for fund raising with Organo Gold Products, selling them as a fund raiser for the club. Interested to hear members thoughts about this idea? Thanks to Marea arranging Yuri to come along. Saturday was the 2013 SCGRFL Grand Final. Our outstanding ticket office management skills and ticket collection at the main gates were on show once again. Thanks to our great team Helen, Andrea, Veronika and David, Alex, Ross and Marlene, Paul and Kathy. Great job, well done, 8.30am start and finished 6.30pm. Oh, a special thanks to Alex, he stayed back to help count money with Rhondda, Extra Mile this week, well done Alex. Mai Yamanaka (NYSF) is unable to attend our meeting as guest speaker this week. We will reschedule with Mai. No guest speaker this week, early night????? Chairperson: No Chair this week. We have certainly had a dramatic few days on the Sunshine Coast and across the state. Nambour seems to have fared pretty well and I hope you have all escaped serious problems. Spare a thought, though for the businesses along Petrie Creek that have been flooded yet again and of course the people of Bundaberg, Gympie, Maryboroug, Logan, Laidley and many other towns. I thinks we should discuss our club response to the floods this week. Also this week I will have a short video about the fight against polio in India. Last weeks speaker, dental nurse Amy Henderson delivered a very comprehensive presentation on dental hygiene. I think we all learnt a bit and the number of questions indicated a lot of interest. Next week I'm suggesting another social night, perhaps at the Royal Gearge. As we move into the second half of the Rotary year there are a couple of projects we could possibly have a look at. We have had an expression of interest from Nambour High Principal, Wayne Troyahn about restarting an Interact Club at Nambour High. 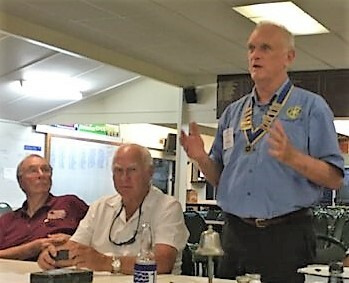 At the other end of the age range, Ken Crichton, a Past President of our club has asked us to consider forming another Probus club in Nambour. I will get a few details together so we can discuss the suggestions at the next board meeting and follow that with a club discussion at one of our February meetings, probably the 20th. Happy New Year to all and welcome back to Rotary. As it has been a while since the last report I have left in some content from that report in case anyone has forgotten. In ClubRunner I have set up our member database and attendance records since July. There is also a roster in place which is accessed by a link on the home page, top right corner. For each job there is a primary member and a reserve in brackets. The following week the reserve will take that job. You should see if you have a job at the bottom of your bulletin. Hopefully that will work! This week will be a casual meeting to get us back in the swing of things for the new year. We are all saddened by the passing on Saturday 29thDecember of our Honorary Member and Past President Keith Thomson after a long battle with cancer. I extend our sincere sympathies to Leila and Jenny. 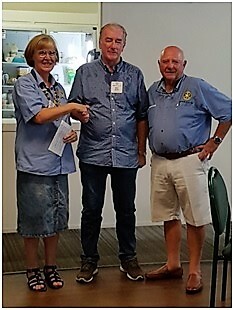 Keith's career in Rotary commenced in 1972 when he joined the Rotary Club of North Rockhampton and while some of our records are sketchy, he continued in Rotary with membership of Nundah, Nambour 76 (twice) and Maryborough North clubs until about 2001 when he was made an Honorary Member of Nambour 76. 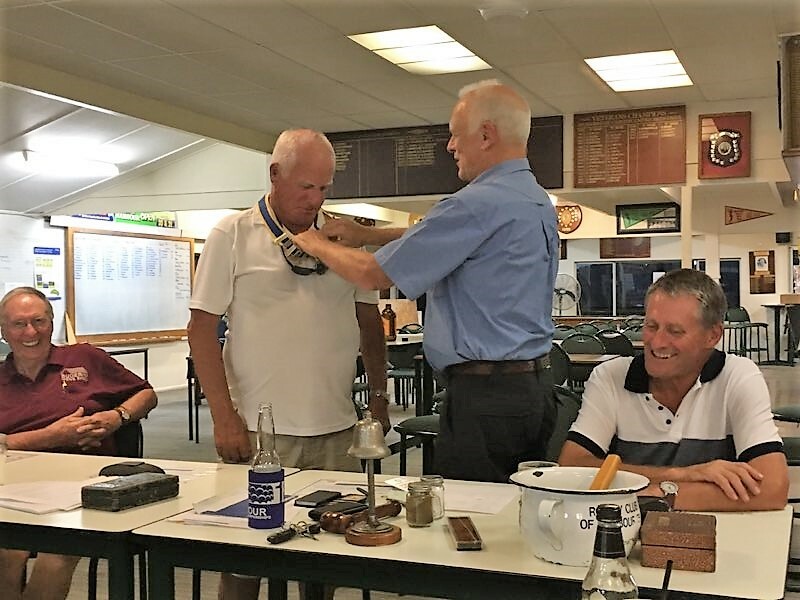 While at Nambour 76 Keith served as Secretary, Club Service Director, Foundation Chair and he was elected as President in 1988 only one year after starting his second term of membership at 76. He was also a member of the Sundale board for many years and he was largely instrumental in creating the Probus Club of Nambour 90. He was awarded a Paul Harris Fellowship in 1991. Much of Keith's time at 76 was before my involvement with the club and many will have known him better but I always remembered Keith as a real gentleman who will be missed by us all. This is bulletin number 2 prepared using ClubRunner. Since last week I have set up our member database and attendance records since July. Ther is also a roster in place which is accessed by a link on the home page, top right corner. For each job there is a primary member and a reserve in brackets. The following week the reserve will take that job. You should see if you have a job at the bottom of your bulletin. Hopefully that will work! Welcome to our first Bulletin prepared using ClubRunner. ClubRunner can also be used to prepare our website, maintain our member database and keep attendance records. As time permits you will see these features taking shape. For now if you click on the home link above you will get some idea of what the web site will look like. 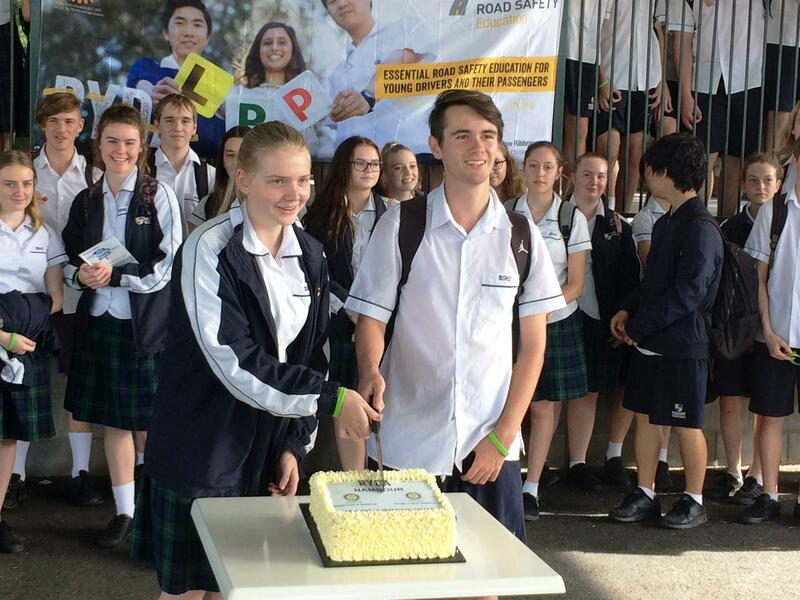 We invite you to view the latest Newsletterfrom Road Safety Education Limited. In this edition, Director of Education, David Murray talks about the new Australian health and physical education curriculum. Also we discuss the review of the RYDA Program, NZTA's new Drive Social Campaign, changes to New Zealand's drink driving laws and some of the new active safety systems recently announced by Toyota. We feature the current 'hot' topic of mindful driving as well as an article on how to maximise a power-nap to help combat driver fatigue. We hope you enjoy these, and the many more articles in the March 2014 edition. On our wine Trail weekend, 14th, 15th March 2014. We stayed at Clovely Cottage (winery and cellar door) Moffatdale. The B&B accommodation was just great, very homely feel with three caravans parked under a tree alongside the B&B. The girl’s visited Murgon on Friday afternoon to do the shops over while the men relaxed under the shady tree back at camp. Friday night dinner was at The Cooperage Restaurant at Dusty Hill Estate winery. Excellent venue, meals and great value. One of the many highlights of the weekend was breakfast time. The conversation and carry on in the kitchen was priceless, you just had to be there. How do you boil an egg? 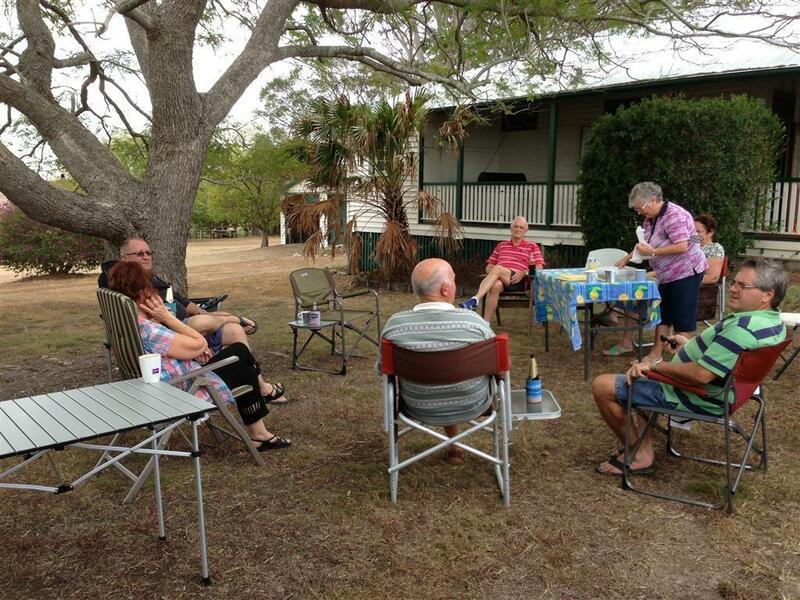 Saturday was a busy day with morning tea at Bjelke-Petersen Dam, lunch and wine tasting at Moffatdale Ridge winery out on the deck looking over the Barambah Creek and the country side whilst being entertained by a gentleman playing a saxophone (very hard life). Bridgeman Downs Cellars was the next winery for more tasting. Then back to the Clovely to have happy hour (felt more like 3 hours) and repair for our BBQ dinner. 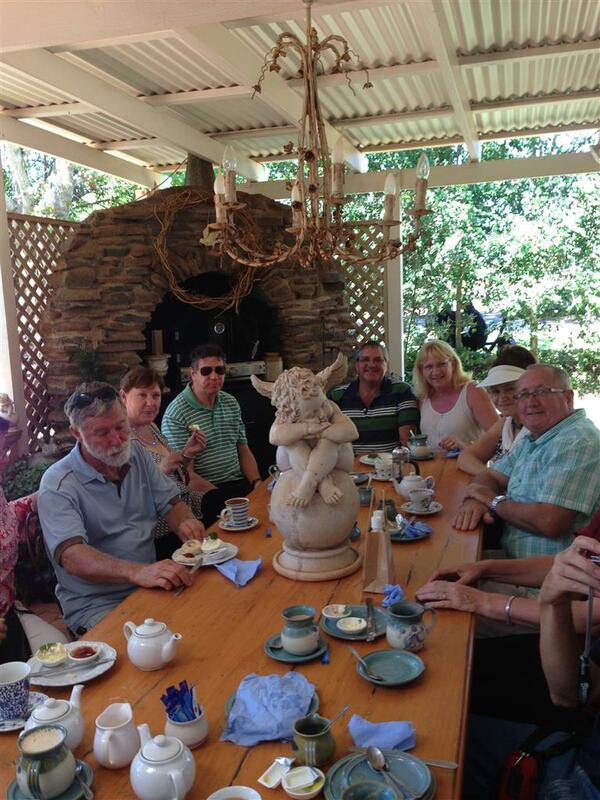 Sunday, we were off to Kingaroy to visit the Lavender farm and have morning tea before departing for home. Thank you all for a great weekend. We may have to do a return visit some time to do over the winery’s we missed. 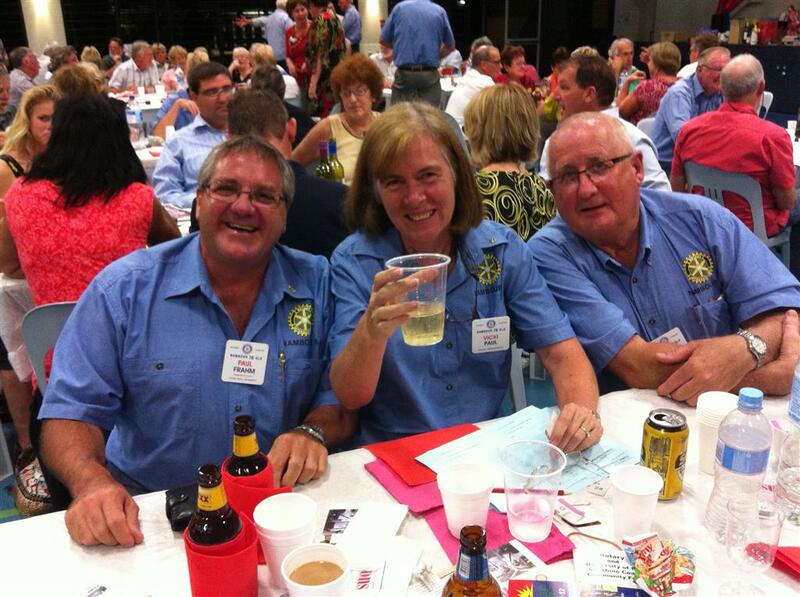 Last week we attended the interclub Trivia Challenge hosted by the Rotary Club of Caloundra Pacific in aid of ROMAC. ROMAC has been in operation for over 25 years. 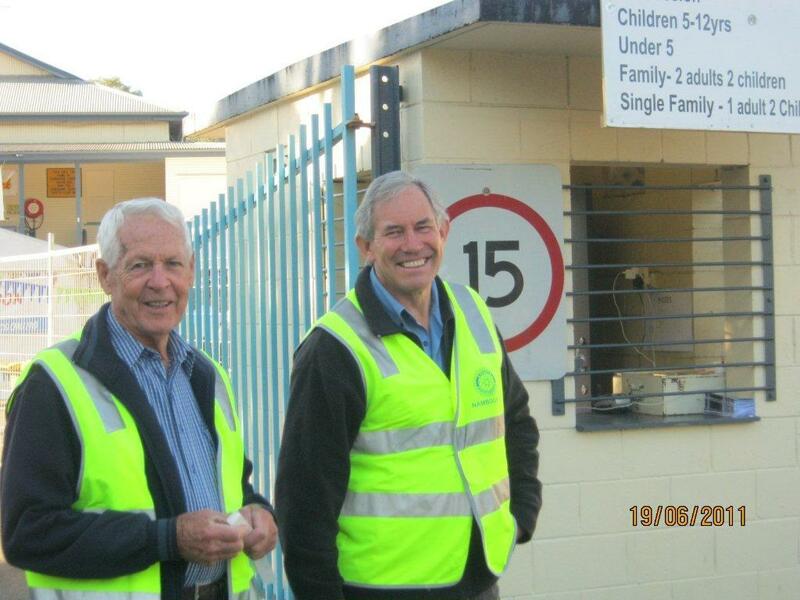 Rotarians volunteer their time and expertise to run this Rotary program that encompasses all the Districts of Australia and New Zealand. Assisted by many eminent Australian and New Zealand surgeons who generously donate their time free for the treatment of our patients, this humanitarian program has provided over 350 children from more than 20 developing countries with urgent medical treatment that has given them new hope. Firstly our sympathy goes out to Bill and Helen with the sad loss in their family. We are all thinking of you in this sad time. Happy Father’s Day to us, Oh and don’t forget the Grand Dad’s (Poppy’s). Where would we be without us? Busy couple of weeks. The weeks are flying buy and don’t forget vote this Saturday 7th September 2013. Can’t wait for that!!!!!!!!!! Sunday 25th August was the 7 Sunshine Coast Marathon. What a great day and event. We were there flying the Rotary Club of Nambour 76 flag in gusto. The Sunshine Coast weather really turned on a beautiful day. Early start saw a stunning sun rise over the river, ask Alex to show you his happy snaps of the sun rise, great work Alex. Thanks to the team for your help, Alex, Ross, Marea and James, Graham, Bob, Hisashi, David Oliver, Kathy and not to forget El President. Great job team, cheering on the runners in their quest to run their feet off. What amazed me was the age scale of the runners and the different styles of the way people run, it was quite entertaining. Sundale Dinner, This was another great night with great attendance by our club. Thanks to Sundale for inviting the club to wonderful diner, food was delicious and the catering staff did a fantastic job. John Kleinschmidt’s speech was very informative and I’m sure brought back many memories for the elders of our club. Row for Cancer Event, Saturday 31st August, Bar was open. Thanks to Marea, Alex and Paul for attending. It was another lovely sunny day down by the river. Monday this week is RYDA, Thanks to Ross for helping to set up at the last moment. Ross is a life saver when you need help. This Saturday, 7th September 2013, SCGRFL Grand Final, Man the ticket office and gates, will need at least 8 people. Only have Paul, Helen and Bernie in the blue book at this stage. 9am to ???? Reminder to contact Motel to book your room. We have penciled in 4 rooms. Presidents Report 14/8/2013. Ekka Show Day Holiday. Welcome to my report, short one this week. Well it was a full on meeting last week, ran a little long and late but a lot to cover. It’s been a busy week, where has it gone? We will have a guest speaker this week, Kristina Lamb. Some points of interest for Month of August 2013. Susan Blake, Aug 5. Hope you remembered Alex! Bruce Lawton, 19 Years, 16 August 1994. 1st Duty Officer: Graham Robertson. 2nd Duty Officer: Bob Sellars. There will be no meeting on Wednesday 28th August 2013. This meeting will be replaced with the Sundale 50th Anniversary Dinner on Tuesday 27th August 2013. Welcome everyone to my first report, a bit late but some might say better late than never. Thank you for your great feed back on the Changeover lunch. Great to see everyone had a good time and delicious lunch. It was wonderful to see our District Governor, Trevor Taylor and his wife Robyn enjoyed their time with us. Our first meeting also was a good night celebrating Bob Sellars anniversary of 50 Years in Rotary, Great milestone for Bob to reach. It was wonderful to see everyone and partners come out to help celebrate this event with Bob and Lex. 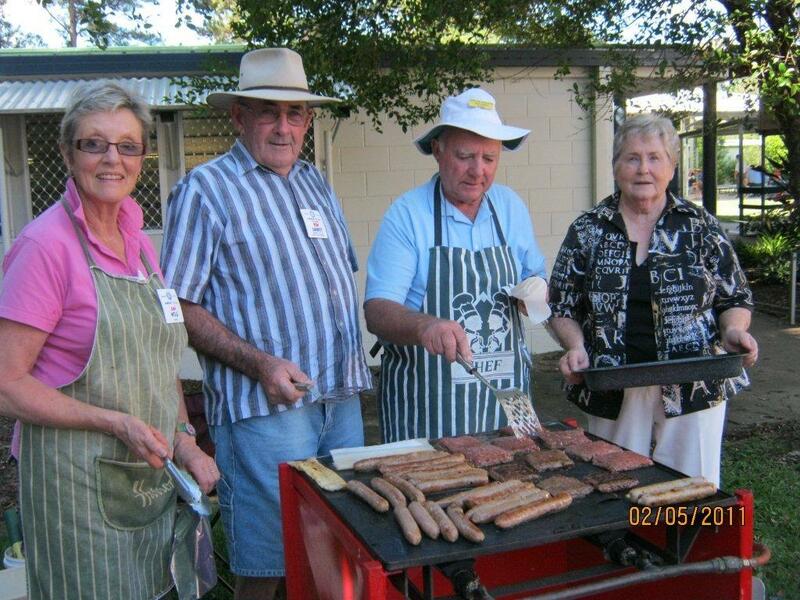 Last week was the combined meeting with Woombye Palmwoods, Nambour 76 and Nambour Clubs. The DG’s visit with Joe Kearney ADG chairing the meeting. Another good night with reports from each club President. Leading up to this meeting the club president’s and Assistant DG meet to discuss future combined projects. Melanie Ferguson has a project in mind of raised garden beds to be built at Mary Mackillop Village, Carter Road, Nambour. We all agreed this would be good combined project to take back to our club’s for endorsement. We were also asked by organizers of the Sunshine Coast Marathon to man road closed points on Sunday 25th August 2013. Our services will be required from 5.30am to 12.00 Midday. We would need 40 people to man these locations. This would also be a combined club project raising approx $2,500 shared between the clubs. The club board will meet for the first time this Tuesday, 6th August. The board will meet on the first Tuesday of each month. Remember to check out the Club Events section on the web site. Reminder, Our Membership Dues are Due, $200 Year, $100 Half Year. Marea is waiting, receipt book in hand. I guess the heading should say Past President's Report but that doesn't read right so I'm taking a bit of poetic licence for my last report. First of all, congratulations to Paul on his induction and also to both Paul and Kathy for organising a very successful and enjoyable changeover. I also want to take this opportunity to reinforce my remarks made on Sunday about Ross Jackson. Ross has been president twice and had a hand in just about everything else since 1977. We have always been able to rely on him to be the first to volunteer and he thoroughly deserved his Paul Harris Sapphire and the Peter Bennett shield for "going the extra mile". The annual report appears below. Just a quick word this week. I'm saving my energy for my annual report which will be in the next bulletin in time for the changeover. This week we have a friend of Gordon's visiting from the UK who has agreed to act as a guest speaker. I wonder if he will mention the Rugby? The current version of the Garden Expo Rostercan be accessed from the web site (click on home at the top of the bulletin, click on the link at the top of the home page and then the link to the left). The roster looks good and all we need is a couple more for the driveway on Friday morning (Jan Lawton is a possible there but she has to confirm). The following Friday (12th) we have the Car Rally gates at the showgrounds. Click on the event to the left of the bulletin and then on "attending" to see who is down for that. We still need about 3 more for that night. Finally another reminder about logging on to the District 9600 website members area. You will need this login to access the new online District Directory. You will need your Rotary International ID number and your date of joining rotary. I have emailed this information to each of you last week. Another finger food casual night at the Golf Club this week and as the raffle has jackpotted 2 weeks in a row we will have a draw this week for the princely sum of $15. I also heard a rumour that there may be a President's shout. No matter what we will be away in time for kick off. For board positions we have Paul as President, Helen as Secretary, Marea as Treasurer and President Elect. Possible we need board positions responsible for Club, Community Service and Membership. We circulated the Garden Expo Roster last week and the current version can be accessed from the web site (click on home at the top of the bulletin, click on the link at the top of the home page and then the link to the left). There are still some holes so please let Ross know where you can help. Finally, you would all have seen Helen's email about logging on to the District 9600 website members area. You will need this login to access the new online District Directory. You will need your Rotary International ID number and your date of joining rotary. I will be emailing this information to each of you in the next day or so. Sad news this week. Helen's mother, Kath passed away on Sunday after failing to recover from a fall several weeks ago. We got the call while at the show gates on Sunday morning and the St John's volunteers were very understanding when we decided to leave and head for Brisbane so Helen could be with her family. Many of you have heard this news already and we both thank you for your kind words and the flowers which arrived today (Tuesday). The show has been and gone and by all reports the show officials are very happy with the way the St John's crew handled things. It seems we have successfully passed this job on to a group which will benefit from the funds received in years to come. Next job is the Bli Bli Road gate at the Garden Expo and we will have a roster drawn up for this week's meeting. Last week we discussed what we are going to do as a club next year and the following dot points summarize the topics raised. Club Service -bulletin to stay much as it is now, guest speakers about once a month and where possible we look at combining with the other clubs in our cluster. The member database and attendance records will be maintained in Clubrunner. Fundraising - Show and expo gates, International Car Rally and Rugby League gates. The golf day in September in conjunction with Cooroy will be our major fundraiser. International Service - our commitments to The Rotary Foundation will be reduced. Youth Service - RYDA will be the major project with the Aust NZ youth exchange and NYSF the most likely programmes we will support. RYLA and RYPEN would depend on us finding participants. Vocational Service - Aim towards 4 vocational visits during the year. PR - We will try to use Facebook as a means of communicating with "Friends of Rotary". We promote a full club effort to visit the Sydney RI international convention in June 2014. That gives us a plan for the next Rotary year and what remains now is to decide who is going to do what, so give some thought to where you can help and that will be the main topic of discussion at this week's meeting. Also note that our AGM will be held at the meeting of July, 24th. After a good social night with finger food last week it's back to business this week. We will have the room at the golf club set up a little differently so that everyone can get involved. We all need to get behind Paul for next year and the next couple of meetings will be where we decide what projects/activities we are going to get involved in and more importantly, who is putting their hands up to drive them. I've never been a fan of terms like "strategic planning" and "SWAT analysis" but I guess we do have to go down that track a little even if in an informal way. I am suggesting that we use this week to get some ideas down and the following week to fill in the details so have a think about how you can get involved. After Lesley's talk last week I think we will all see Sashi in a new light. Thanks to Lesley for her insight into her exchange student experiences and I hope we can take her up on her offer to tell us more about her life in Japan. We have a busy time coming up - Show Gates, Garden Expo and International Car Rally all within a month. Paul will have details of changeover night shortly so expect that date to be within the next month also. The board has had a meeting to start some planning for next year and one event that was discussed in some detail was the Golf Day we will run in conjunction with Cooroy. The date is set for September 30th and we will need a full club effort to make it a success as our major fundraiser for the year. The first effort needs to be getting the word out to potential sponsors and players. This and other planning matters will take up the next few meetings (when State of Origin doesn't interfere). As this week is game 1 we will have a casual night at the golf club with finger food rather than a full meal. With a vote last week of 9 to 7 against handing in our charter, we are still in business. It was great to see Peter Crosby back and speaking passionately to keep the club going. It's now up to us all, no matter how you voted to get behind President Elect Paul and decide what you are going to do to help the club next year. I suggested last week that we devote the next few meetings before the end of the Rotary year to discussing what we do, who is going to do it and what structural changes we can make to help ensure the future of the club. I will be working with the board to get some guidelines in place for our first meeting in June. This week we have Lesley Takeda as our guest speaker and I guess her topic will relate to her interesting life experiencing the cultures of Japan and Australia. Partners are very welcome to attend. First off this week, some sad news - Justin Crosby, brother of Peter, died on Thursday after a 2 year battle with cancer. Justin's funeral will be held at Stella Maris Catholic Church, Baden Powell Street, Maroochydore tomorrow, Monday 20th at 11.30am. I have passed on our condolences to Peter and Marilyn. On a brighter note, Peter is doing well. He is back at work in a limited capacity and able to get around fairly well as long as he doesn't overdo things. We wish him well in his recovery. I have had a late advice (with an apology) of Cooroy Club's 20th Anniversary tomorrow (Monday) night. If anyone needs a makeup - the details are 6:30 for 7:00 at Cooroy RSL. Cost $25. And don't forget Woombye-Palmwoods' 20th Anniversary next Monday. Last week it was good to hear from our speaker Dennis Morris about the Rural Fire Service and in particular, the Palmwoods brigade. The meal at the Emperor was really good but I guess one problem with the venue is that it's a bit small and the seating is a bit haphazard. This week we are back at the Golf Club and we do not have a guest speaker organized because we need to have yet another discussion on the future of our club. I think we are at the stage where we need to vote on the question "Does The Rotary Club of Nambour 76 hand in its charter". Your board has discussed this at length and it's now time for the club to decide. If you are not going to be at the meeting then please let me know your thoughts beforehand. The Combined Sunshine Coast Clubs meeting at the Sunshine Coast University Innovation Centre turned out to be an interesting night. We heard from 3 recipients of scholarships resulting from Rotary donations and the guest speaker for the night was local surgeon, Dr Bernie Tamba-Lebbie who hails from Sierra Leone. He delivered an inspiring talk on his journey from Sierra Leone to the Sunshine Coast. This week we have the opportunity to try out another potential venue. I wasn't sure of the name of the cafe but it is called Empire Organics and it's in Mitchell St opposite the police station entrance. There is parking at the rear or in the council carpark next door. They don't normally open on Wednesday night but the owner, Lyndon is interested in opening for us as a trial. Helen & I went there for dinner on Friday night and had a great meal with some excellent entertainment. The area is small but we can fit in OK. This will be a normal type meeting with our guest speaker, Malcolm Brown who will be speaking about the Rural Fire Brigades in this area. There are 2 new upcoming events that we need numbers for - Woombye Palmwoods' 20th anniversary on May 27th and Sundale's 50th anniversary on 27th August. Details are on the homepage of the website. The Crossroads BBQ has been and gone. Thanks to cooks, Veronika, Bernie and Sashi. We had a trial meeting at Miller's Cafe last week. I would be interested to get your comments on Millers as an alternative venue. This week we are at the Combined Sunshine Coast Clubs meeting at the Sunshine Coast University Innovation Centre. The Innovation Centre is the first building on the right as you drive into the University and parking is behind the building. The guest speaker for the night is local surgeon, Dr Bernie Tamba-Lebbie. Fellowship starts at 6 with the guest speaker set for 7:30 so it will be a slightly later night than we are used to. Our next meeting after that was to be back at the Golf Club but the opportunity has come up to try out another potential venue - The Little Cove Cafe in Mitchell St. They don't normally open on Wednesday night but the owner is interested in opening for us as a trial so we are going to hold the meeting of the 15th there as a normal type meeting with our guest speaker, Malcolm Brown who will be speaking about the Rural Fire Brigades in this area. 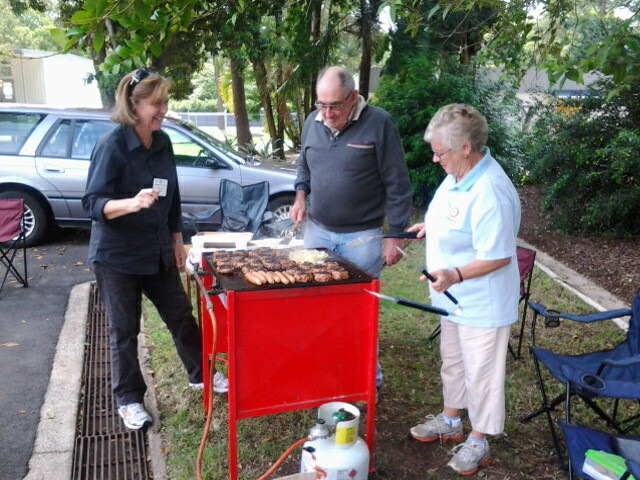 Thanks to those who volunteered for the Crossroads BBQ on 4th May. It's an easy job, we only need to cook burgers. Details are on the website and Helen will be organizing the patties, buns and coleslaw next week. At our meeting last week we had an informal discussion led by our guests, DG Dai Mason, DGE Trevor Taylor and AG Leo Smith. In broad terms, the subject was "How to survive as a small club".Even though our numbers were small we still had a good night. It seemed to me that we should be able to survive as a Rotary Club but some changes will be needed. Venue, club projects, cost and the need for new members were all discussed. One change we have started to think about is venue and to this end we are having a trial meeting at Miller's Cafe this week. There will be a pre prepared meal for us but at this stage we do not have any details. Nor do we know whether BYO alcohol will be OK. We need to get the OK for this from the owner of the cafe, Janine. Janine will also need some idea of numbers so if you are NOT coming please let Helen know by Tuesday. It is a partner's night so if you are bringing your partner also let Helen know. Times will be as normal and for those not sure, the cafe is on the corner of Bury and Currie Streets right in the centre of town, just downhill from the council chambers. Last week I sent an extra to the bulletin with the details of the Red Cross Blood Donor Challenge. The details are still in this bulletin and it is up you individually if you wish to participate. The Crossroads BBQ is getting close (4th May) and we still have no names in the blue book. Please give it some thought - it's an easy job and we only need 3 people to cook some burgers. Details are on the website. This week we will have a short ANZAC tribute to start our meeting followed by an informal meeting with discussion led by our guests, DG Dai Mason, DGE Trevor Taylor and AG Leo Smith. In broad terms, the subject will be "How to survive as a small club" so come prepared to have your say. Good Morning and thank you for registering your Rotary Club to participate in the 2013 Sunshine Coast Rotary Club Red Blood Challenge. We are very pleased to welcome the Rotary Clubs of Mooloolaba, Alexandra Headland, Maroochydore, Buderim, Nambour, Nambour 76 and Woombye-Palmwoods as participants and thank you for your support. The challenge will run from 1st April to 12th May 2013, with the club that receives the highest percentage of donations (based on their membership numbers) to be awarded the inaugural Sunshine Coast Rotary Club Red Blood Challenge trophy. Please find attached a poster to distribute to your members, families and supporters with details of the challenge, locations to donate and how they can register their support for your Rotary Club. rolling up their sleeves and helping to save lives. How will members know if they can donate? Attached is a copy of the Australian Red Cross Blood Service's Eligibility poster with some basic guidelines. Alternatively, for more detailed information donors can visit www.donateblood.com.au or call 13 14 95 to speak with a Blood Service team member. Donations can be made at any of the following Sunshine Coast locations during the challenge. To make an appointment to donate blood call 13 14 95. Alternatively, you can also make a donation on the Sunshine Coast Donormobile. During the challenge it will visit the following locations: Coolum, Noosa, Tewantin, Caloundra, Kawana & Gympie. How can members count their donation towards the challenge? Simply make a donations at any of the locations below during the challenge and register to join the Sunshine Coast Rotary District 9600 club red. * Fill out the attached Club Red Registration Form and handing it in to the Blood Service staff when you go in and make your donation. (Registration for Club Red takes place after you've made a donation of Blood, Plasma or Platelets. The support of your club is very greatly appreciate. If you have any questions or require further information, please feel free to contact me on the details below. Roll up your sleeves and give blood. Call 13 14 95 or visit donateblood.com. You will see from the speakers' list on the website that we have our program in place up to May 8th except for May 1st. Perhaps we can visit Miller's cafe on that night? This week our speaker is Jane Loxton, a Registered Nurse - talking about Pancreatic Cancer. Jane is studying towards a PhD funded by Australian Rotary Health. She may well have a book for sale on the subject with proceeds to go to ARH. I have had a request for some help from our former member and Past President John Stevenson. John has been storing the plywood screens we use at RYDA but he is unable to do this past next week. Does anybody have some spare space to store these sheets. There are about 20 of them ranging in size but mostly about 1M square. I have all the upcoming events listed on the website now along with the names of the members who can help out at each event. All the events are well supported except the crossroads BBQ. I've copied an email from Alan Donaldson below which has the details. Now that the Schools are back we have been in touch with the Yandina School and we can now confirm that the Crossroads Picnic will be at the Yandina State School on Saturday 4th May from 9.30 to 2.00 with lunch at about 12.15. Numbers don’t seem to change much from year to year but we will let you know as soon as we have possible numbers. 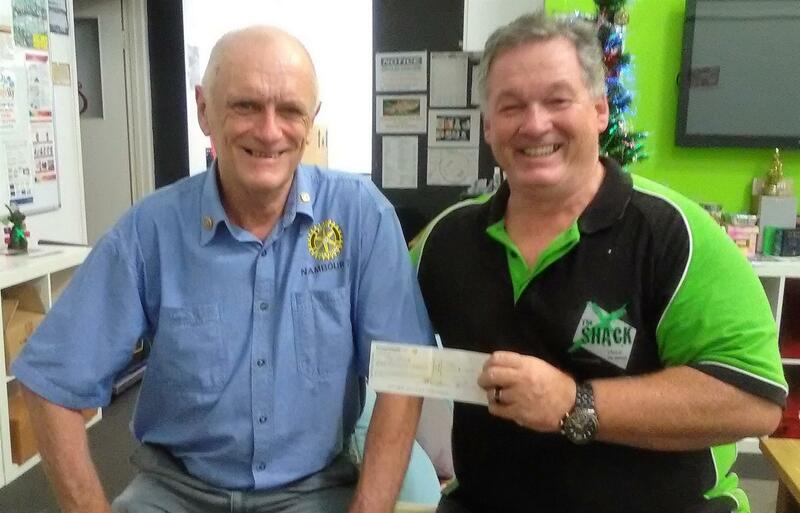 We really appreciate this contribution from Nambour 76 Rotary Club. Crossroads is a Uniting Church organization supporting disabled adults. Bernie has agreed to deliver and collect the BBQ but we need 3 cooks and someone to carry out a few welding modifications to the BBQ beforehand. The cooking is quite easy, some hamburger patties and onion and the rest of the food preparation is done by the Crossroads volunteers. Because this event is now on a Saturday rather than the Monday holiday most of the usual helpers are not available (and Ross and Paul will still be away) so we need some new blood to help. So let's get some names down in the blue book this week. It's an easy and rewarding project. I have been asked by a few members how to log in to the website. The process is to use your email address as the login name and your name in the format of First.Last as the password - that is capital letters to start each name. Our guest speaker last week was to be Lucille Watson on the topic of The Brooke Charity but Lucille had to postpone until next week (17th) because of illness. This week we have Marea's daughter, Kristina as our guest speaker. I have put our upcoming activities on the website and those of you who have your names in the blue book will have received a confirming email. At this stage we have 3 days of RYDA on May 13th., 14th. and 15th followed by some limited involvement at the show and the garden expo plus the Qld Rally Special Stage and the latest addition is the Crossroads BBQ on May 4th. It was good to have another well attended social night at the Royal George last week. This week we are back at the Golf Club and our guest speaker will be Lucille Watson on the topic of The Brooke Charity. This organisation commenced in 1934 when Dorothy Brooke, shocked at the plight of ex-cavalry horses, bought 5000 of these animals and went on to set up a free veterinary clinic. Lucille lives in Woombye. You will all have seen an email from Leo Smith about the next working party to the Solomons. A couple of people were interested in this so now is the time to put your hand up. Now that we look to be set to continue as a viable club it's time to look at upcoming activities. At this stage we have 3 days of RYDA on May 13th., 14th. and 15th followed by some limited involvement at the show and the garden expo. It has also been suggested that we should be able to devote a lot more emphasis on the golf day this year (probably in September) and with a bit of luck and hard work we may be able to make that day our major fundraiser. We will have the blue book set up for these events this week. As is often the case, last week's speaker Frances Cahill gave us a very interesting talk on her career experiences with the written word. There has been a late development in relation to our club's future. I've been asked by the District Governor if we could delay any decision until he and AG Leo Smith can come and address us. Due to commitments with the District Conference and the RAWCS project in the Solomons this can't happen until late next month. I've agreed to the request so for now everything is on hold and this week we can still discuss the issue but the main item of business will be a brief board meeting. First, two reminders - this week we meet at the Royal George and don't forget to bring back the questionnaire that Paul handed out last week. After more discussion last week it seems that the weight of opinion is that we try to keep our club going. That certainly is encouraging news and time will tell how successful we will be. I will try and get DG Dai Mason and ADG Leo Smith to visit and talk to us on our meeting of April 24. We have had some meetings with St John's P & F about the show gates and they have agreed to pay us $500 if we can provide some help. We have also been contacted by Marion from the Garden Expo who has asked if we can operate the Bli Bli vehicle gate only and they will pay us accordingly. No details yet but we need to discuss it as a club first. This weeks speaker is Frances Cahill and her topic is "Grammar is not a dirty word". After some interesting points raise at last week's meeting it was clear that we no longer had the ability to run the show and expo gates. We have written to both organizations with this news and Helen called and spoke to the relevant people, who were both shocked and dismayed. In the case of the show gates, the P & C at St John's College have agreed to take them on and the Show Secretary was delighted to hear this news. On the issue of whether we continue as a club or not, it seemed to me that the discussion settled to two choices. We fold and hand back our charter with those members who wish joining Nambour or other clubs. We continue with an executive of President, Secretary and Treasurer and see what the future brings. I certainly have an opinion on which choice we should adopt but I don't want to argue the points for and against as I don't think that's my role. The decision has to be made by the members and to this end I hope we can reach a decision at the meeting of March 20th which is set aside for another discussion on the issue. 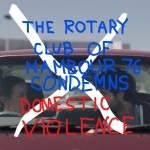 Our meeting this week (6th March) is listed as a club discussion but there is only one topic to discuss and that is does the Rotary Club of Nambour 76 continue or not, that is – should we or should we not hand our charter back to Rotary International. I know that’s very blunt but as some of you would know the board has discussed this very point recently and we are concerned about a number of things. · Our numbers are continuing to decrease and we have had very little success in attracting new members. · Our two major fundraisers – the show and expo gates are becoming much more difficult to maintain. · We are having difficulty finding someone to fill the board and other vacancies for next year. None of these issues are new but this year, for a few reasons everything is becoming more difficult and the time for a decision is now before we commit to another year in Rotary and before we commit to the show and expo gates. I could go on with lots of points for and against handing back our charter but the time to discuss these points is at this week’s meeting so come prepared to present your opinion. Everyone who wants to speak will have the opportunity and anyone who wants to talk to me before the meeting please don't hesitate. After an enjoyable night last week with Cooroy Club and the outgoing VTT we have a change of venue and date this week. a full night of entertainment with 100% of the proceeds donated to ROMAC. (ROMAC) to enable them to continue saving the lives of underprivileged children. A very interesting speaker last week, Angie Andrews on the benefits of Alovera. Angie, an author and actress has written 4 books and one is a recipe book based on Alovera. She had some copies with her and it appeared that the sales of autographed copies were going quite well. Angie also won our $5 raffle prize. It was encouraging to see a good show of hands for helpers on the show and garden expo gates. Lets hope we can muster enough people to run these events. 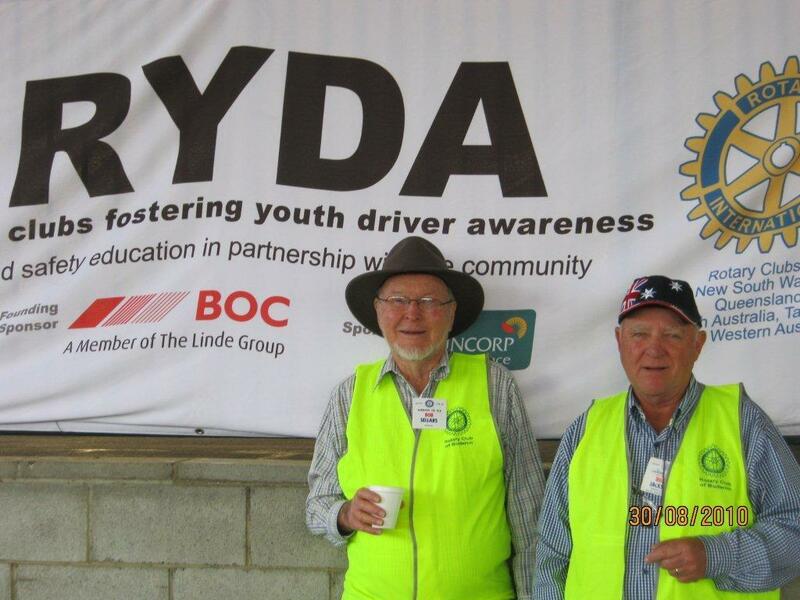 This week we will host the outgoing Vocational Training Team and the Rotary Club of Cooroy. Partners are welcome for what should be an interesting night where the team will present a dress rehearsal of the presentations they will be making in Amsterdam. The following week is the trivia night in aid of ROMAC on Thursday 28th (replaces our meeting of the 27th). I'll advise the details as soon as I know but I should have all the information by this week's meeting. The Long Lunch at Eumundi on Sunday 24th in aid of Katie Rose Cottage has been sold out and we were not able to book a table. I've left this report late this week until after tonight's board meeting. The most important points from that meeting concern the gates at the show and garden expo. We are seriously concerned about our ability to muster enough people to run these events. We will have a show of hands tomorrow night to get some idea of where we stand. Our speaker this week is Angela Andrews on the benefits of Alovera. 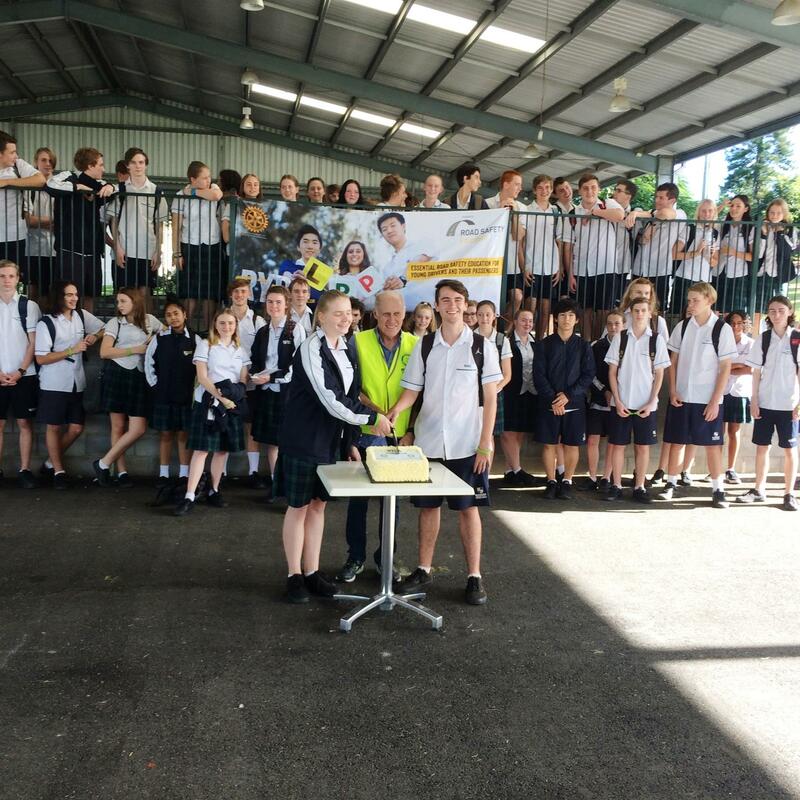 The following week will be a visit from the outgoing Vocational Training Team and combined with Cooroy club. Partners are welcome that night for what should be an interesting night where the team will present a dress rehearsal of the presentations they will be making in Amsterdam. We have two events coming up - the trivia night in aid of ROMAC on Thursday 28th (replaces our meeting of the 27th) and a Long Lunch at Eumundi on Sunday 24th in aid of Katie Rose Cottage. We will need numbers this week. Last week I sent our member and ex member list to ClubRunner. The data has now been uplloaded and everyone will have to reset their passwords by clicking on the “New and existing users - Retrieve your password” link from the login page. Simply enter your last name and email address and the details will be emailed to you. You will see that Honorary and Ex Members are now included. An important reminder to start off - This week's meeting is at the Royal George Hotel (NOT the Golf Club). Paul will be in the chair as helen and I are away on a well earned break - at least we think it's well earned. Following our discussion last meeting about the Vocational Training Team visit combined with Cooroy, I have received this reply from Tania, the team leader. "I am currently trying to work out a way that our team can make it on time to your meeting. Two of our members finish work at 5pm so they are concerned that they may not be able to make the meeting in time. Is there anyway that they could present at 7pm? The presentation will be about 20-25 minuites long. I am really keen to have the whole team be able to present to both of our clubs. The other option is possibly scheduling a weekend meeting perhaps a Saturday night. I'm inclined to go with the later finish option on Feb 20th but Paul will get a response from you all at this weeks's meeting. After some discussion last week we have donated funds to the Salvation Army to assist with flood relief. 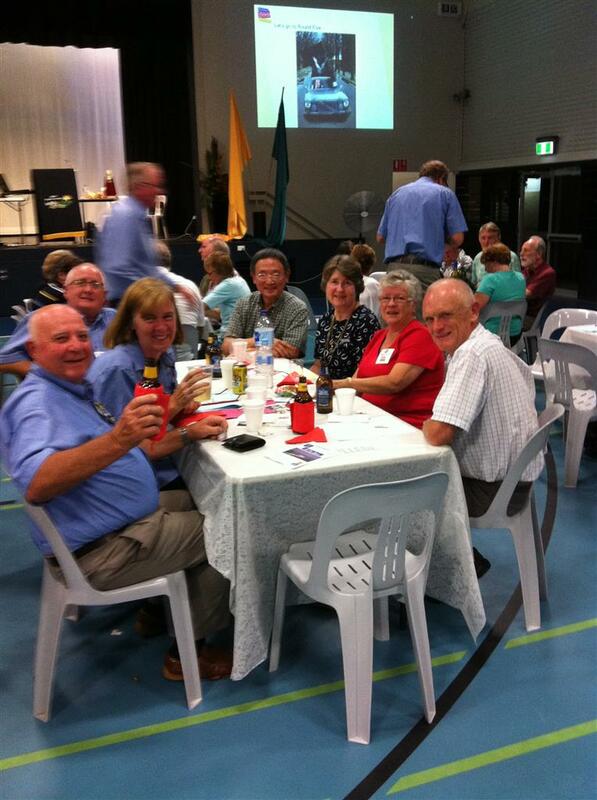 Welcome to the Rotary Club of Nambour 76! This week we have our first guest speaker for 2013. Amy will be speaking to us about dental care. I have been asked by the team leader of the outgoing VTT, Tania Broadbent from Cooroy Club if we would consider shifting our proposed visit by the team from Jan 30th to a combined meeting in February either at Cooroy or Nambour. It would seem that Monday 18th or Wednesday 20th would be suitable. We can talk about this at our meeting this week.